The Outdoor Power Equipment Institute (OPEI), issues the following safety tips about children and lawn mower safety. Alert nearby people. Make sure the people in the area know you are going to mow. Confirm the locations of pets and children, and ask that they be kept out of the area and supervised. Know how to operate your mower. Read the operator’s manual to understand controls. Know how to stop the machine quickly. Do not remove or disable guards or safety devices. The best place for children is away from an operating mower. Do not let children run or play near mowers. When a lawn mower is being used, it is best for children to be inside and under the watchful care of a responsible adult. Clear the area being mowed. Remove debris, wires, branches, nails, rocks, or metal that may become projectiles if thrown by the lawn mower blades. Do not give children rides on a riding mower, even with the cutting blades turned off. If you put a child on a riding mower, even with the blades turned off, they may run into the yard asking for another ride later when the machine is being operated and could be seriously hurt. Avoid going in reverse. Be vigilant when putting your mower in reverse or approaching blind corners or obstacles that impede your sight line. Look down and behind you when backing up. Use extreme care when approaching blind corners, shrubs, trees, or other objects that may block your view. Maintain control of your mower, even after you are finished mowing. Store and lock your mower. Keep keys out of the reach of children. 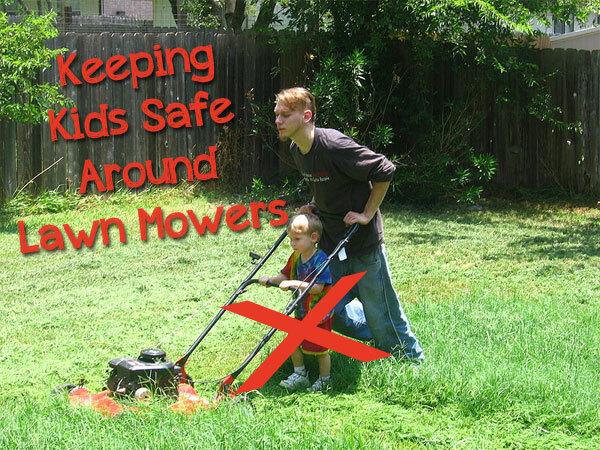 Make sure others know your feelings about your child and contact with mowers. You may not allow your child to ride on your mower, but someone else may offer your child a ride. Make sure others know that you do not want your child to ride on a mower or operate a lawn mower.See our fact sheet on children and lawn mower safety and go to www.OPEI.orgfor more safety tips and information.